Les Piaules, the most Parisian hostel. 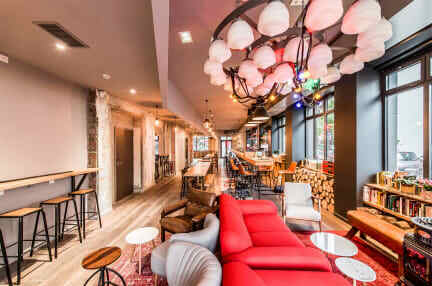 Recently opened by 3 young Parisian travelers in a fully renovated art deco building. Les Piaules offers a rooftop terrace with fantastic view on Paris iconic monuments, fast free WiFi, check-out until 12am, custom bunk beds (with curtains, reading light, power plugs, private lockers and comfy mattress), the coolest bar in town with a carefully curated selection of local beer, coffee and French specialties. We also offer: 24/7 reception, Multilingual staff, Local food and drinks, Custom bunked, City expert desk, High speed free WiFi, Badass breakfast, Rooftop terrace & view. 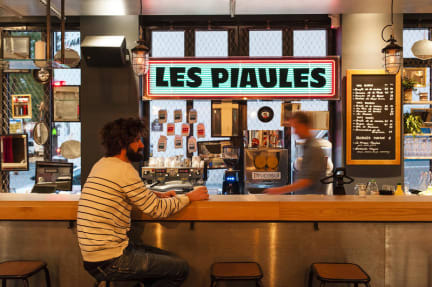 Les Piaules is located in the arty district of Belleville which features a bunch of bars and coffee shops full of young and cool people, and close to all must-see in Paris (50m from Belleville metro hub). Sleep in our comfy custom beds. Plan your days & nights with our city experts. Connect to our high-speed free WiFi. Feel at home. Rooms have curtains, reading light, power plugs, private lockers and comfy mattress. Taxes not included - occupancy tax 0.88 EUR per person per night. Badass Breakfast : 7.00 EUR per person per day. Age restriction: Minors are accepted only under these three conditions: 1) they book private rooms/entire dormitories 2) they stay with an adult 3) and they have an authorisation from their parents/legal guardian. Wow. Really an amazing stay. Staff was friendly, dorms and beds where extremely clean, and everyone was so great. Made some friends from all over the world and I can safely say I don’t think I’ll find a better hostel than this! Overall quite a nice place to stay, the rooms were top notch as was the breakfast and bar service. The only thing I wish this place had was a laundry service but given its proximity to local laundromats it’s understandable they don’t. I stayed at Les Piaules for a week and liked it! Clean rooms, comfortable bed, clean toilets & showers. One big minus though: no common kitchen. As breakfast was very basic (even the badass breakfast, for 7.5 euros you hardly got anything) it would have been nice to have common kitchen for preparing some snack or breakfast yourself. Also there was no place to store groceries. Staff was friendly, but lot of the times they didn't pay attention to people approaching the desk. Pros - Very culturally diverse area. Privacy curtains on bunks were a huge plus. Bed was comfy, with warm comforter. Great views from roof. Cons - Location is far from the metro station. Reception is at the bar, so easy to miss. Elevator was broken my entire stay. En suite toilet continued to run after flushing. Main overhead light in the room was too dim to be effective.